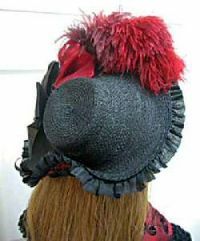 Pictured on Bleuette's Big Sister Suzanne SFBJ301 costumed by Nelly Valentino of Timeless Treasures. This straw hat has a front brim that is tipped back slightly in the center. The back of the brim is turned up and tacked to the back of the hat. 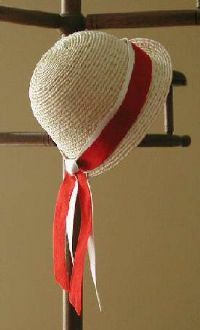 This hat may be decorated by placing a ribbon around the crown adding loops of ribbon, feathers or flowers. 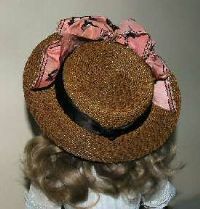 You may also pleat some lace or ribbon and add to the inside of the brim in front. Head circumference is approximately 13 - 14 inches. Requires approximately 30 yards of 1/4 inch hat braid sold separately or as part of a Kit. This is for those big, beautiful dolls. The broad brim is turned up and a little wider in front. The crown is flat with the base of the crown encircled with a broad ribbon tied into a bow with long sashes. Head Circumference 14-15 Inches. Requires approximately 35 yards of ¼ Inch Braid. 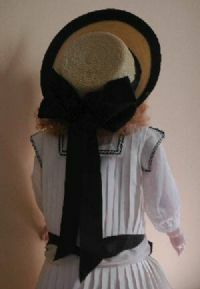 Tell a friend about our new hat forms for smaller dolls!! 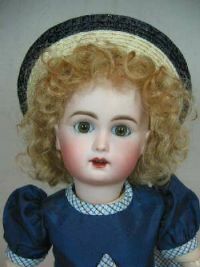 This cute cloche hat is designed to fit Bleuette, the new Seeley's Lady dolls, and Dianna Effner's 10 inch dolls or any doll head with a circumference or 6-7 inches. Requires approximately 8 yards of 1/4 Inch Braid. 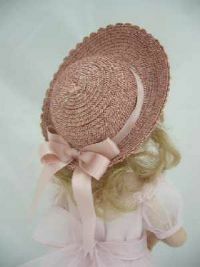 This very popular hat is NOW available in several sizes and is styled for a child doll. The broad brim is turned up. It may be decorated with flowers or ribbon around the crown. 034 a head circumference of approximately 12-13 inches. Requires 22 yards of braid, sold separately or as part of a Kit. 034-A a head circumference of approximately 10-11 inches. Requires 18 yards of braid, sold separately or as part of a Kit. 034-B a head circumference of approximately 9-9 1/2 inches. it requires 14 yards of braid, sold separately or as part of a Kit. 034-C a head circumference of approximately 8-8 1/2 inches. This size fits Rosette. It requires 12 yards of braid, sold separately or as part of a Kit. 034-D a head circumference of approximately 7 inches. it requires 10 yards of braid, sold separately or as part of a Kit. 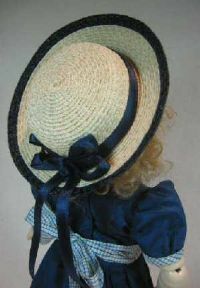 Pictured hat is natural and dark navy braid on Bleuette Jumeau painted and costumed by Nelly Valentino of Timeless Treasures. This hat fits a child doll with a head circumference of approximatley 6-7 inches. This is a smaller version of hat form 34. 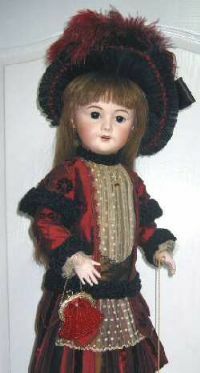 It fits Dianna Effner's 10 inch dolls or Bleuette. Requires 10 yards of 1/4 inch braid, sold separately or as part of a kit. 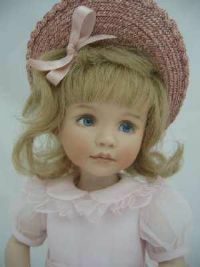 Another darling hat for your 10 – 11 inch dolls. The front brim is a little larger in the front and slightly tipped back. The crown is slightly rounded on top and the sides softly taper around towards the back. Finish decorating with a ribbon around the crown and a bow and in the back. Requires approximately 10 yards of straw braid. Small flowers may also be added. Fits a doll with a head circumference of 6-7 inches. Step by step instructions are included with every form. 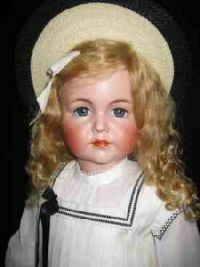 NEW - 35 A - now available for dolls with 5 inch head circumference.